Dang, I had this idea about a year ago, but never got around to actually implementing it. Good job! But beware that I may launch a competitor currency this year. This is quite neat! I plan to make some neat stuff for this soon. My id is k3s72l1pfa. Currently mining at about 4.2MH/s on 7 of my cores. well hmmm, I typed in a password to create a account and it logged me into someone else's? they must have had the same password? The password is essentially the username. That is a big security flaw. That's a flaw of the wallet, not the protocol. It shouldn't be a problem if you use strong passwords and double vaults. One question, though: how decentralized is the currency? For example, can a server host its own "blockchain" and then federate with your server for transactions? The in-game wallets connect to trusted server nodes. It is decentralized in that no one node can do whatever it wants, but centralized in that only trusted parties are allowed to host nodes and see their code. This is probably going to change in the near future. Also, what's the mining payout falloff? Every 210000 blocks, the subsidy from each block is halved. The total supply can be calculated to therefore be 21,000,000 KST, as per this formula. Can an "admin" give himself money? No. Crediting Krist requires mining. What kind of a hash is it? For mining, you need to find a SHA256 hash lower than a certain target. This target changes periodically so that a block is always found about once per ten minutes. What you're hashing is the concatenated strings representing a) the hash of the previous block as proof they were solved in order, the address to which mined funds are to be deposited, and c) an arbitrary cryptographic nonce that is incremented to change the hash until it is lower than the target. This can only be done through trial and error; thereby requiring billions of computations. For addresses, I have made my own system to prevent bruteforcing. It takes an indeterminate number of computations to derive an address from a private key, and you cannot look for patterns in the address until you assemble the final product. You can look at the code yourself if you want the details. Just wondering, what is considered to be a good hash rate? Interesting, I got ~3.3 million with 4 cores, not sure if they were all pushing hard although. I was not expecting everyone to mine so quickly so soon! It's getting hard for me to solve blocks now! It don't know whether the plan was to only use this with ComputerCraft or not but I think a Bukkit plugin would be great. 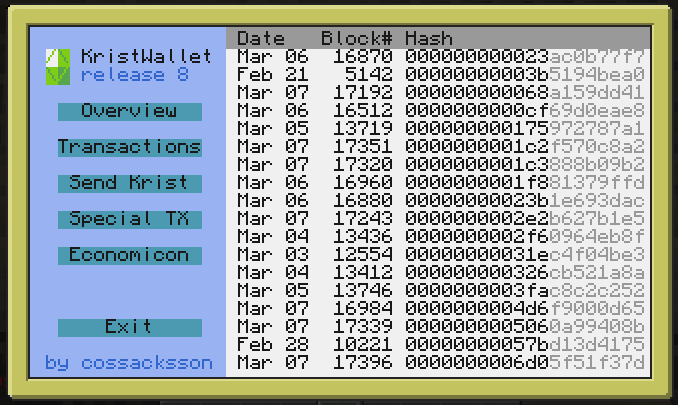 With a Bukkit plugin, even vanilla servers could use this and give their users the possibility to trade in Krist or to convert Krist to another ingame currency (but not vice versa). That would make Krist more popular. I would like to write a Bukkit plugin if I am not planning in the wrong direction. Regarding external krist applications, am I allowed to make an android app that acts similar to the kristwallet for cc? coss, do you think you could add a long polling event system? This would allow doing things like waiting for a block change without having to poll for the last block every few seconds. Maybe something like this? So is this based off Bitcoin? Edited by Atenefyr, 07 March 2015 - 05:35 PM. Edited by CrazedProgrammer, 07 March 2015 - 05:59 PM. Edited by Atenefyr, 07 March 2015 - 06:03 PM. how many hashes is one kst? Considering the type of application, this REALLY should work on pocket computer. Even command line support would be great. Mind implementing? Edited by Atenefyr, 07 March 2015 - 10:50 PM. It can be a bit of luck too when mining Krist. These are fantastic ideas. Krist is not a CC system; kristwallet is. The possibilities are therefore essentially without limit. Krist would work on any game capable of calling the network. This would probably be better for the nodes and miners alike. I will be looking into this. Yes, although it is built from the ground up. No code from Bitcoin was used. I guess you could say I'm really into it, though. Yep, this sounds about right. Except the hashrate part. I suspect we are at a fraction of a gigahash right now. Maybe 500 Mh/s tops. For comparison, when mining bitcoin, I can, by myself, manage 1Gh/s. I encourage you to share your work. We have, collectively, found four hashes with ten leading zeros. If this were 2010, those would be good enough to make 200 BTC. If we find a block with 12 leading zeros, I'm making this into a full-time project. Who likes new fancy GUIs? Edited by Zambonie, 08 March 2015 - 12:26 AM. EDIT: May I ask, how exactly do you send requests to "mine" KST? I know the link is http://65.26.252.225...nonce=<mynonce>, but how do I use this URL to send a "mining request"? Edited by Atenefyr, 08 March 2015 - 02:18 AM. The recent commits fixed the speed calculation. It was wrong all along. * Generates a Krist v2 address using the original algorithm. * This was direclty ported from the KristWallet source (release 8). String v2 = "k"; //All keys start with 'k'. I've tried to accomodate for Java's substring/array differences, but Part 2 always ends up generating some longer incorrect addresses for some reason, and I'm stumped. What is 1+(2*n),2+(2*n) ),16 ) % 9 for? Edited by longbyte1, 08 March 2015 - 03:33 AM. Edited by slow-coder, 08 March 2015 - 04:43 AM.